Discussion in 'Eldar' started by Wartortle, Apr 14, 2018. Eldar playerbase flaming and complaining about the bolter part 20446. 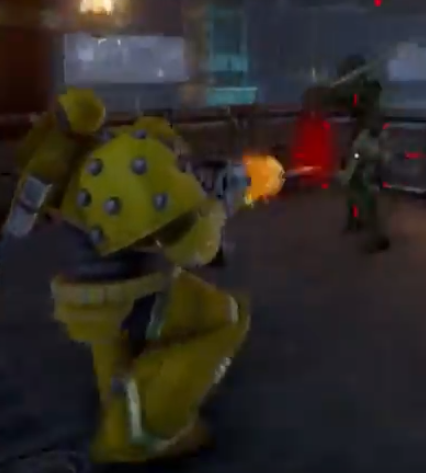 Seriously, do you guys need another bolter nerf to stop complaning about nade bursts and bolter damage? Aislinn, Wartortle, Oan-Mkoll and 1 other person like this. The only thing I see actually wrong with this video are those airbursts. Sure, scorpions can rob you of precious reaction time, but at least you can counter that by watching your back and having teammates to back you up. Nade tricking works so well in close quarters because it takes advantage of the sluggish netcode and lag compensation to give the target no time to react. Usually, by the time the player sees the animation of you tossing the grenade or any warning indicator that they could reasonably be expected to react to, you have already shot it on your screen. That, and only LSM and CSM can abuse it to this extent, because only they can reliably burst their nades with a single bullet. Only Orks with their Slugga pistols could potentially do the same, but their grenades are far easier to react to anyway. if you want to test this out yourself, i'm happy to jump in-game, but nade tricks do not take advantage of the sluggish netcode nor the lag compensation, you'll notice that when lagging that shots actually whiff on nades so if anything it makes it next to impossible to nade trick with garbo ping. Aislinn, ZeGit, Wartortle and 2 others like this. To be fair: You are air-bursting a lot. I literally flinch every time something yellow throws a grenade at me. No profound commentary on EC's balance was intended. The match I had shown in the video just had a lot of scorpions. I dunno man, I can count on one hand the amount of times I've been nade tricked even in fights against BLOP. If you are caught unawares however, that's another issue entirely, a lack of situational awareness should rightfully be punished. Things shouldn't kill me if I don't expect them!!! The latter part with the space marine theme blasting was pretty funny though.